HARARE, May 22 2015 (IPS) - Nompumelelo Tshabalala, 41, emerges from her dwarf ‘shack’ made up of rusty metal sheets and falls short of bumping into this reporter as she bends down to avoid knocking her head against the top part of her makeshift door frame. “This has been my home for the past 16 years and I have lived here with my husband until his death in 2008 and now with my four children still in this two-roomed shack,” she told IPS. Tshabalala lives in Diepkloof township in Johannesburg, South Africa, in a densely populated informal settlement – a euphemism for slums, where an estimated 15 million of the country’s approximately 52 million people live, according to UN-Habitat, the U.N. agency for human settlements. Neighbouring Zimbabwe has an estimated 835,000 people living in informal settlements, according to Homeless International, a British non-governmental organisation focusing on urban poverty issues. “Slum-dwelling here in Africa has become normal, a trend to live with, which is difficult to combat owing to numerous factors ranging from political corruption to economic inequalities necessitated by the growing gap between the rich and the poor,” Gilbert Nyaningwe, an independent development expert from Zimbabwe, told IPS. Overall, out of an estimated population of 1.1 billion people, Africa has more than 570 million slum-dwellers, reports UN-Habitat, with over half of the urban population (61.7 percent) living in slums. Worldwide, notes the U.N. agency, the number of slum-dwellers now stands at 863 million and is set to shoot up to 889 million by 2020. 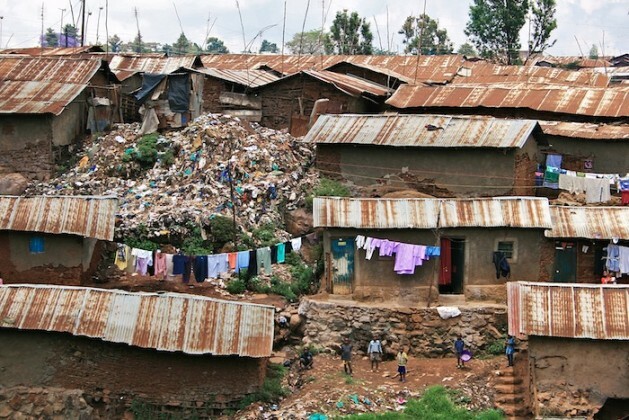 Development agencies in Africa say slum-dwelling remains a continental trend despite the U.N. Millennium Development Goals targets compelling all countries globally to achieve a significant improvement in the lives of at least 100 million slum dwellers by 2020. According to the United Nations, that 100 million target “was met well in advance of the 2020 deadline”, and in African countries such as Egypt, Libya and Morocco the total number of urban slum dwellers has almost been halved, Tunisia has eradicated them completely, and Ghana, Senegal and Uganda have made steady progress, reducing their slum populations by up to 20 percent. However, sub-Saharan Africa continues to have the highest rate of “slum incidence” of any major world region, with millions of people living in settlements characterised by some combination of overcrowding, tenuous dwelling structures, and poor or no access to adequate water and sanitation facilities. Hector Mutharika, a retired economist in late Malawian President Kamuzu Banda’s government, blamed poor service delivery for the increase in slums in Africa. “The increasing numbers of slum dwellers in Africa is due to poor service delivery here by local authorities which more often than not worry most about filling their pockets from local authorities’ coffers instead of channelling proper housing facilities to poor people, which then pushes homeless individuals into building slum settlements anywhere,” Mutharika told IPS. For Rwandan civil society activist Otapiya Gundurama, the roots of the problem go far back in time. “Shanty homes in Africa are a result of the continent’s urban infrastructure set up during colonial rule at which time housing and economic diversification were limited, with everything related to urban governance centralised, while towns and cities were established to enhance the lifestyles and interests of a minority,” Gundurama told IPS. Some opposition politicians in Africa, like Gilbert Dzikiti, president of Zimbabwe’s opposition Democratic Assembly for Restoration and Empowerment (DARE), see the trend of growing slums here as a result of government failure. “The perpetual rise of slum settlements in Africa testifies to persistent failure by governments here to invest in both rural and urban development,” Dzikiti told IPS. African civil society leaders blame rising unemployment on the continent for the continuing rise in the number of slums. “Be it in cities or remote areas, slums in Africa are a result of huge numbers of jobless people who hardly have the means to upgrade their own dwellings,” Precious Shumba, director of the Harare Residents Trust in Zimbabwe, told IPS. African slum-dwellers like South Africa’s Tshabalala accuse city authorities of ignoring the mushrooming of informal settlements for selfish reasons. “Slums here are sources of cheap labour that keeps the wheels of industry turning, which is why local authorities are not concerned about our living standards because they [local authorities] are getting more and more revenue from firms thriving on our sweat,” Tshabalala told IPS. Meanwhile, rising slum settlements in Africa are also having a knock-on effect for other development goals in the education and health sectors for example. “The United Nations Millennium Development Goal of universal attainment of primary education for all by the end of this year is certainly set to be missed by a number of countries here in Africa, especially as many of these sprouting slum settlements have no schools to help the children growing in the communities get any education,” a senior official in Zimbabwe’s Ministry of Primary and Secondary Education told IPS on the condition of anonymity for professional reasons. At the same time, “there are often no toilets, no water and no clinics in most slum-dwelling areas here, exposing people to diseases, consequently derailing the MDG of halting the spread of HIV/AIDS and other diseases in informal settlements,” Owen Dliwayo of the Youth Dialogue Action Network, a lobby group in Zimbabwe, told IPS.